So, I may have mentioned that when I signed my book deal with Razorbill, my youngest son asked for a pony. I had a tiny part of that dream come true today, friends. I was sitting at breakfast, reading the Austin American-Statesman paper. I turned to the Books section (as one does), and there was a great article about YA fantasy, and why it is so freaking awesome, and why everyone should buy their kids fantasy books every day of their lives, isn’t the REALITY of middle school enough to merit the escape into fantasy, people… sorry, got on my soapbox. Cynthia Leitich Smith spoke extremely well about the topic, and I was waving my pom poms. Yay, Cynthia! Yay, YA fantasy books! And then I turned the page, and saw the list of twelve “highly recommended fantasy” reads for this summer. Marissa Meyer, James Dashner, Veronica Roth? Checkity check check. My book was there. Right next to (as my son pointed out) the photos from the Hunger Games and Harry Potter movies. It took some explaining that, no, we still weren’t getting the pony yet.But ice cream? Oh. yes. Time to celebrate! Isn’t this the coolest thing? I’m so happy today. * When I explained to him that he’d have to clean a barn, he amended his wish for just a pony. He also wants a “pony butler” to clean up the poo. I’m going to have to write some seriously bestselling books, people. I have no business blog posting, since I am in the final stretch of a MONSTER deadline-fueled drafting process… but I need to post a question. I am about to put together my “author visit” page, and I wondered, for those of you dear readers who are teachers and/or librarians, what exactly makes for the most successful author visit? I taught for years, and spent a decade doing weekly public speaking in my work at both churches and schools. I LOVE interacting with groups of kids, and the chance to do this again is a part of the publication/marketing/writing process that is a super huge bonus cherry-on-top for me.But author visits are new territory. I would welcome any and all advice, tips, hints, or horror stories you might want to share! Oh, and if you’re a teacher or librarian (or know one) I’ll send you bookmarks AND stickers for your kids — if you send me a tip AND use the blog contact form to send me an address to mail them! So, how’s THAT for incentive? Oh, friends, I am a VERY busy little bee down here in Texas. I have a super tight deadline for a new project, and I may be away from the blog more than usual for the next two months. (For an idea of how tight the deadline is, my word quota to hit for TODAY alone was 4,000. Not quite there yet…) Still, I have my Wonder Woman Underoos, an enormous stash of chocolate, and a family grown accustomed to cereal for dinner. I will prevail! Still, I had to share the two lovely pieces of news I had this week, and one from last week as well. Last week’s news: I had a poem accepted by the Texas Poetry Calendar, an anthology of poets from Texas, or who write about Texas. The calendar comes out in 2013 – but you can always pre-order a copy! 🙂 Or pick one up at Bookpeople when the time comes. This week: My day started with a Facebook message from a writer/teacher I met in Houston a year ago. She teaches 6th grade Pre-AP English, and had assigned a book report. One of her students asked if she could report on a book that isn’t out yet – her mom had snagged an ARC of it at a conference, and the girl had read it and loved it. Of course, the book was mine, and my teacher friend and I both squealed with delight. I will TOTALLY be sending the autographed bookmarks to that class! I can’t even tell you what a rush it was to think some kid who I am NOT genetically related to read my book, and loved it enough to do a report on it. So. Freaking. Cool. Then, at the end of the day, my friend and fellow writer/blogger Samantha Clark posted her incredibly thoughtful review of Sinister Sweetness. I’m overwhelmed. Samantha is so smart, and reads so closely – with an eye to the construction of the novel, as well as the overall result. Thank you, Sam. Now, it’s back to the page for me. And then off to New York next week, where I will do writerly things with my agent and editor, birthday celebration things with my mom and sisters, and shopping things… well, not so much of that. But still — New York!!! PS – If you want something fun and fresh to read by a local author who is diving bravely into the non-fiction self-publishing waters, check out my funny, lovely friend Pamela Hutchins. I think How To Screw Up Your Kids sounds like fun… wait. Did that come out right? Good luck, Pamela! We don’t say the whole name. We’re too excited, for one thing, and we’re too breathless. But all the kidlit community knows instantly what we’re talking about: the Texas Library Conference. This year it was in Houston, and it was… amazing. It was THE PLACE to be to meet famous and not-so-famous authors, librarians, teachers, booksellers, book buyers, publishers, editors, bloggers, and book lovers of all ages. I think every Texas writer who can go, should. If not to meet and mingle, then to be surrounded by so many people who are deeply passionate about books. It does the heart good. Here are some of my favorite pictures, with some of my favorite people from this year’s TLA! Wait! What's that? My ARC??? And candy-covered bookmarks? Hooray! Yes, this was sort of totally awesome. Now on to other people. The YaHous! Awesome Houston Authors Lynne Kelly, Mary Lindsey, Jenny Moss, Joy Preble, Christina Mandelski, and Crystal Allen. Apocalypsie Meet-up! With Megan Miranda (FRACTURE), and Lynne Kelly (CHAINED). Probably not cool to snap iphone pics at the publisher's cocktail party but OMG JOHN GREEN, right? With my friends Salima and Samantha. The Texas Sweethearts (No Scoundrels here): Jo Whittemore, Jessica Lee Anderson, Kari Anne Holt, and Jeanette Larson. Look at those awesome books! OMG David Lubar. And, yes, my friend Kari is totally photobombing us. Austin Authors take TLA by storm! Also by tennis shoes. What NOT to wear to TLA? Pinchy shoes. Ouch! Seriously, I could post pics all day. But I won’t. I’ll just say, be there next year! Breadcrumbs and Witches: Got Any More Ideas? Hi, y’all! I’m getting ready to present a speech (or two) at the Houston Writer’s Guild conference this weekend, and this week I’ve been putting the finishing touches *coughwritingtheentirethingcough* on my “keynote” speech. I’m talking about the journey of the debut writer (because, duh, right?) and I’m comparing it to all sorts of gruesome and macabre fairy tales. Inspired, I know. What I was hoping YOU could help me with is this: what small piece of advice (let’s call it a breadcrumb) do you wish you’d had when you first started writing? I would love to have a few of these to flash up on the powerpoint (alongside the usual subliminal pictures of chocolate and hot guys) that didn’t all fall out of my own rotting brain. So, what do you say? Do you have any breadcrumbs for our new writers, to help keep them on the path? Or any warnings about witches? Who are the witches in your writing life? My guess is, if you’ve been writing for a while, you won’t name editors and agents… but you might come up with some ideas I could steal and use this weekend. 2. Don’t forget to leave a comment on Cynthia Leitich Smith’s blog, Cynsations, to win an ARC of my novel, THE SINISTER SWEETNESS OF SPLENDID ACADEMY… and chocolate, too! You have until April 9. Not long. 5. I have been reading up a storm. I fell in love with two middle grade books this week. The first was Claire LeGrand’s THE CAVENDISH HOME FOR BOYS AND GIRLS. I cannot express how delightfully wicked and perfectly terrifying I found this book. I have embarrassed myself on Twitter and elsewhere gushing about it, so I’ll stop now. But I WILL start up again closer to its expected arrival in August! The other book I just finished tonight. I picked up an ARC of The Bad Apple at ALA Midwinters. I wish I hadn’t waited to read it! It was AMAZING. Full of humor and mystery, mischief and heart. Speaking of hearts, I found my own heart actually racing at one point, I was so caught up in the story. Seriously, folks: palpitations. 6. A shiny new idea knocked on the door today. It was completely unexpected, and strange. And frightening — I’m not sure about this one. It’s quite visceral and dark… and funny, but sad? I have a few pages. I don’t know what’s in the plot yet, but this poor character, in his dire situation…? I can’t wait to see if he survives it. Happy April, Friends! Write well. This is an exciting week for me! The Advance Reader Copies of The Sinister Sweetness of Splendid Academy are making their way out into the world, and so far the reviews have been lovely. If you would like to win an ARC of my debut novel (don’t you want to? DON’T YOU??? ), just hop on over to the extremely excellent Cynsations blog. Cynthia Leitich Smith, my friend, mentor, and all-around splendid person, is hosting a giveaway. Not tempted? Then check out the CHOCOLATE and swag that goes along with it! Now you want it, don’t you? Debut author Lindsey Scheibe’s RIPTIDE, pitched as Jennifer Echols/Simone Elkeles meets the movie BLUE CRUSH, in which a seventeen-year-old is training for a big surf competition — her ticket out of an abusive household — and trying desperately to keep from falling in love with her best friend, to Brian Farrey at Flux, in a two-book deal, for publication in 2013, by Mandy Hubbard at D4EO Literary Agency (World English). I had the delight of reading and critiquing some of the earliest drafts of this book – and I’m so thankful I did! The world is going to love this book. Wait… did I say book? I meant BOOKS, Ms. Two-Book Deal! Squee for Lindsey! And last but NOT least, you have two days to RACE over to the Authors for Henryville website, hosted by the lovely YA author and all-around wonderful human, Julia Karr, to donate to help rebuild the public libraries in Henryville, Indiana devastated by the recent storms… with the chance of winning one of my ARCs! One last note: The launch party for a new middle grade novel that I heartily recommend is coming up this weekend, on Saturday, at Bookpeople in Austin, 2 p.m. The book is The Chronal Engine by Greg Leitich Smith, and it’s amazing. Dinosaurs plus time travel plus a great family dynamic plus bad guys? Total fun. I’d love to see you at the launch, but you should buy the book even if you can’t get to Austin. It’s happened. I’m finally cool enough to sit at the cheerleader table. That is, if the “cheerleaders” are Ellen Hopkins, Tom Angleberger, Tera Lynn Childs, Ilsa Bick, Sara Zarr, and Kersten Hamilton, to name a VERY few. And, of course, the “table” is the Dear Teen Me anthology, a book of letters from 70 YA authors to their teenage selves, coming from Zest Books on October 31, 2012. Edited by Dear Teen Me blog founders Miranda Kenneally and E. Kristin Anderson, the letters in Dear Teen Me cover a range of topics, including physical abuse, body issues, bullying, friendship, love, and enough insecurities to fill an auditorium. Your favorite YA authors dissect critical moments from their own young lives, and offer advice and guidance to their teenage selves. I’m so excited to be included in this. And my letter – like all the others — will be a totally new one. But I promise mine will be as awkward and painfully funny (now, not then) as THIS ONE and THIS ONE. So, why not pre-order one of these fabulous, cheerleader-worthy anthologies? Excuse me, I have to go hot-roller my hair now, and look through my old high school albums while listening to Duran Duran. 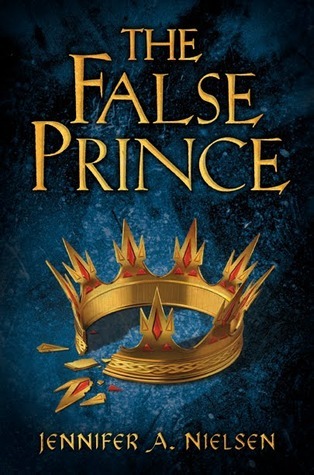 The False Prince ARC Giveaway! A few weeks back, I went to ALA Midwinter and picked up (as one does) a bunch of Advance Reader Copies for books that are coming out in the next few months. Some of them I delivered, unread, to the local librarians who couldn’t attend. Some I read quickly and passed on to teachers and friends who might be able to use the book in their classrooms or book clubs this year. And some of them were STOLEN by my sneaky SON, taken to the middle school, and traded back and forth by him and all his friends because Certain Books are amazingly irresistible. The book is coming out any day now*, and I will be buying at least one copy for me, and possibly one for the boys’ school libraries, so I don’t need the ARC. But YOU DO, dear readers. So, here’s the deal. All you have to do is leave a comment below telling me what book you’ve read (recently, or as a kid) that you would have STOLEN FROM YOUR MOTHER, if that had been the only way to get a copy. That’s it. No blog follows, or any of that stuff. Although, if you wanted to follow my blog, that would be nice, too.